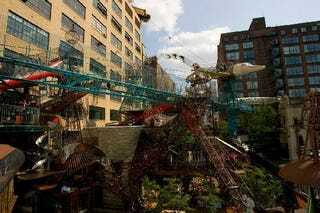 The City Museum of St. Louis is an interactive sculpture park, a surreal adventure playground and an artistic carnival fun-house for the 21st century. There is nothing else like it in the world. Formerly a shoe factory, the 12-story building in downtown St. Louis was bought and then re-purposed by artist/developer/entrepreneur Bob Cassilly during the mid-1990s. A self-described "idiot savant", Cassilly envisioned his new museum as an throwback to the days when institutions trusted patrons to possess some discretion, intelligence and sense of adventure/personal responsibility. And so, instead of antiseptic, padded, lawyer-approved exhibits, the City Museum's outdoor rooftop features slides, a giant praying mantis and an operating antique Ferris wheel. You can also sit in the driver's seat of a school bus that projects out off the roof and over 12 stories of void, if that's what you feel like doing. On the ground floor inside there are huge three-dimensional tunnel mazes intertwined with water features and sculptures of whales and dragons. There's a human Habitrail made of colorful plastic tubing up in the ceiling, a dark concrete cave system big enough to get lost in, and a network of interconnecting cages and tunnels made of driftwood; it's total S.F./fantasy/steampunk sensory overload, all executed, with imagination and artistic flair, out of "found" materials. The young staff members are there to help. They're about as far from "fun police" as you can imagine; patrons are encouraged to explore and enjoy. Along the same lines, there are no "you are here" maps, nor printed map handouts; explore and enjoy. Secret passages run every-damn-where; any hole you can squeeze into is liable to lead into a tunnel, up a ladder and/or down a slide that'll end you up somewhere completely new. At the City Museum you can scale a steel webwork on the inside of a giant dome and end up suspended in a cage 50 feet in the air, or make your way through a series of aerial slinky-tunnels and catwalks in the MonstroCity playground outside to climb into a jet plane on top of a 40-foot pole. I literally lost count of the number of slides that, along with the tunnels and secret passages, are the most enjoyable means of transport around the museum, but the piece de resistance of slides is the spiral helter-skelter than spins you down a full 10 stories into the Enchanted Cave network. The upper levels also include a boutique circus school and folk-art galleries such as the Odditorium (a tongue-in-cheek "beatnik museum" of antique sideshow displays and games), as well as a skateless skate park, an aquarium, a very "museum-like" natural history exhibit and a permanent display of architectural art, showcasing gargoyles and decorative facades from St. Louis buildings dating back to the 19th century. The City Museum is all over Youtube, of course; to close, here's a video memoir by photographer Chris Marquardt, emphasizing the Museum's artistic side.